First time back in nearly 10 years. Beer - as you would expect from a brewery - is first class. The rooms have been spruced up to a very high standard too. After a short drive from Ambleside to Coniston the next stop is the Black Bull which is home to the Coniston Brewing Co.
An old fashioned interior with lots of dark wood tables and red velvet banquette seating set off with red carpet. The walls are adorned with pictures of Donald Campbell and he's ill fated Bluebird mission. Food available and it looked pretty good. This is a large pub that on my visit was fairly empty, there is a great seating area to the front, the ales are good and it's a perfect village location. Another from the 2015 GBG ticked. I liked this pub, although I agree the prices are high. It has Gwent y Draig Black Dragon real cider, which was nice to find far from traditional cider territory. I only ate here once: it was a substantial and tasty Cumbrian sausage with plenty of gravy. Certainly dog-friendly - there were about 6 well-behaved mutts in the bar each night. Full choice of Coniston Beers. I enjoyed Oliver's Light Ale. Coniston is my fav village in the lakes and it's worth the effort to get here for the ale on offer. Looks like The Black Bull will hit the £4 a pint average before a lot of places in London - where I drink quite often. £3.50 for a pint of Bluebird and XB is fine, but where do they get off on charging £3.80 for a pint of their Oatmeal Stout. It's a very nice pint, but come on - it's only 4.2% (same as the Bluebird XB) and brewed just round the corner! Go to any other brewpubs or places where the brewery is just up the road and you'll find the beers a lot cheaper than average for the area. 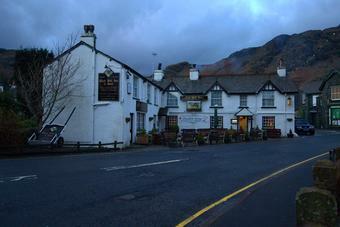 Anyway, apart from the above moan - well kept beers, friendly staff and a nice traditional Lakeland pub.